Chicago Says No More | Chicago Says No More leads the way for salon professionals to Listen. Support. Connect. 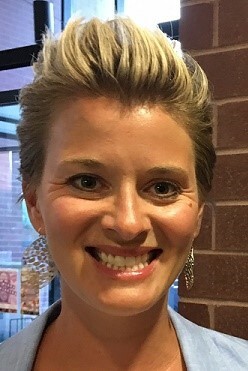 Jessica McCarihan is a member of the Steering Committee of Chicago Says No More and a trained advocate for victims of domestic violence. A first in the country, the Cosmetology Renewal License Domestic Violence Course (HB4264/PA 99-0766), effective January 1, 2017, requires all licensed salon professionals to take only once an awareness and training course which guides them on how to respond to clients who are victims of domestic violence or sexual assault. Called Listen. Support. Connect., this free class is underwritten by Chicago Says No More, the only organization authorized to offer it, and does not increase salon professionals’ requirements for license renewal. Chicago Says No More and Cosmetologists Chicago are grateful to the leadership of Illinois Senator Bill Cunningham and Representative Fran Hurley for their sponsorship of this bill as well as their leadership in educating fellow legislators about the far-reaching and devastating effects of domestic violence and sexual assault. The board of Cosmetologists Chicago generously met with us to review Listen. Support. Connect. as we prepare several certified experts in domestic violence and sexual assault to lead 18 free classes available at this year’s America’s Beauty Show at Chicago’s McCormick Place March 25 to 27, 2017. This is the only time and place salon professionals can take Listen. Support. Connect. until the rules and regulations for the law have been completed. Once those rules and regulations are written—just like they are being written for close to 200 other laws passed last session—this requirement will go into effect. At that time, Chicago Says No More will announce a schedule of free classes statewide. So far, more than 2,000 participants have registered for Listen. Support. Connect. at America’s Beauty Show. There’s still time to register for this free class. For these three days only, professionals can fulfill this requirement for license renewal. As a member of the Chicago Says No More Task Force for Salon Professionals, I am qualified as both a trainer of salon professionals and a DV advocate. I was an educator for L’Oréal and now volunteer as board president of A New Direction, a grassroots organization providing services for survivors on the southwest side of Chicago. I led some of the first-ever training sessions for Listen. Support. Connect. when we tested it during America’s Beauty Show 2016. The question I hear most frequently is why should stylists want to learn about DV and SA. The answer is simple: Because salon professionals already help their clients and they care. Listen. Support. Connect. includes role-playing exercises to demonstrate what it might feel like to offer support to a client. What is so cool about the Chicago Says No More and the Cosmetologists Chicago connection is the organizations’ dedication to their members and those members’ clients in this effort from the start. While supporting the education of salon professionals on this sensitive subject, Cosmetologists Chicago worked closely with Chicago Says No More to protect the safety and liability of cosmetologists in Illinois as well. Together, Chicago Says No More and Cosmetologists Chicago are leading and setting a great example for the industry and in the U.S.
Jessica McCarihan is a member of the Steering Committee of Chicago Says No More and the President of the Board of Directors at A New Direction in Chicago. She is also a trained advocate for those who have been victims of domestic violence. Lend your voice to say NO MORE to domestic violence and sexual assault by taking the Pledge at ChicagoSaysNoMore.org.